We returned to the Brushmill by the Waterfall in Chester, CT for our 4th Saturday Brunch this October. 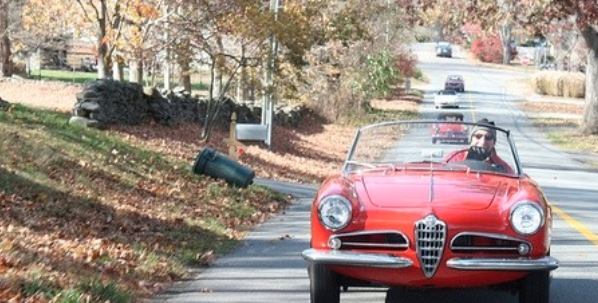 The event started, as all do, with a gathering of Alfas. Seven Alfas graced the parking lot along with some newly carved pumpkins. Fred and Lois Kleykamp joined us, with their red 2nd series Spider. The Restaurant, which manufactured brushes up until the mid-1960’s, offered a fine brush, err--- I mean, brunch menu. The food was great and the Restaurant was not crowded. Some of us toured the small museum on the second floor. Did you know that the brush was one of man’s 10 basic hand tools--yes I know, the first was the hammer. After a great meal, a short drivers’ meeting was held by Rick Citrak. We elected to forego the ferry and take the bridge, eliminating a very windy crossing. Spray on the cars--you know! Leaving the parking lot we were greeted with a drive down a road completely covered with fallen leaves . This was a leafy tour, wasn’t it? With the top down I was occasionally hit by falling leaves and a rare tree nut. Connecticut is a beautiful state. Since we took the Chester-East Haddam Bridge, Rick could not resist taking us on that special road that runs by The Devil’s Hop Yard. The road was fast and our “shocks and brakes” got a good work out. Kathy D. started a roller coaster hands up, going over the small hills, so we all followed suit. Crazy! We drove by Hamburg Cove (actually twice since one was not enough) to see those beautiful yachts anchored there. We drove past Sterling Farm and took a “line up shot” of the cars. Kathy did a great job finding great views of all the cars. Next stop – Beaver Brook Farm. The group toured the wool shop and then sampled cheeses in the market. Many of us purchased cheeses, prepared soups and meat dishes. Rick surprised us all by handing out his wonderful heirloom garlic that he grows himself. They were Italian and German garlic strains, which will go very well with the lamb cuts that some of us purchased. We left with our coolers full of produce and proceeded down to US 1, then over I-95 and on to Shore Road. We stopped at Great Island Boat Ramp, a bird viewing area that is located at the end of Smith Neck Road. Here you can see a great line up of our cars. Amazingly, we all drove Alfas but everyone was unique. A layperson would be at a loss to recognize that they all came from the same manufacturer. Turning to the estuary we had great views of the Connecticut River and water craft traveling up the Connecticut River. Far to the west was Fenwick Island Lighthouse. The wind was blowing out of the Southeast keeping the temperatures comfortable but not to the point that we wanted to stay long. Final stop was the beach at White Sands. Here we parked on my former in-laws property and walked down to the beach. Here I took the photo of the group with my back to the waves. No, I did not get wet. Dee Palmieri for getting the word out and proofreading my prose. With the twice monthly CTAROC brunches located in the western part of Connecticut, club President Dr. Frank LaSala decided to try a more Eastern location for the June 9th 2013 brunch. Unfortunately Dr. Frank was unable to attend due to a conference call with AROC, but he would have been very happy with what transpired. The rain finally ceased falling from the heavens and gave way to beautiful sunshine and provided us with a spectacular rush of water over the falls at the Brushmill Inn - our chosen eastern location in Chester CT. The beautiful setting also provided us with ample parking and encouraged "tire kicking," cigar smoking and lots of catching up with fellow Alfistis. Dan Goldman and Annette Wong, of the New York chapter traveled all the way from Long Island to attend in their beautiful black spider. After our parking lot greetings, we sat as a group at a large table amongst the workings of the old brush mill. The extensive menu for both brunch, lunch, desert and spirits was a pleasant and slightly more costly variation on the standard brunch - but as a once-in-a-while occasion was very acceptable. As we had the entire dark wood lined room to ourselves, conversation was easily heard and relaxed. The meals were quite enjoyable with much discussion of the the fine desserts that had some pondering if a brunch could solely consist of dessert! Following the brunch we traveled as a group to the historic Chester ferry that crosses the Connecticut river. We all were able to squeeze aboard the small vessel; thanks to the efficient size of our beloved marque. Once on the other shore, we drove a short distance to the former home of actor William Gilette. This home/castle is now open to the public. Several of the group decided to tour this strange and wonderful attraction as others enjoyed the fantastic views.